Betsey Johnson Floral Baseball Cap $28 gorgeous print - Mint Polka Dot Scarf $7.99 - Steve Madden Animal Print Sunglasses $38 - Leopard Print Flats $24.99 LOVE these - Marc Jacobs Geometric Print iPhone Case $40.97 - Floral Sneakers $14.99 Floral Canvas Backpack $39.90 adorable - Floral Jumpsuit $29 - Jungle Print Dress $29 - Black Floral Print Jeans $5.99 check out that price! Several years ago I did not wear very many items with prints. Other than the basic polka dot and the striped print, I did not branch out. Now, I love all prints. To me it doesn't matter if it is polka dots, stripes, floral, jungle, animal, or geometric. This week's #stylishforless is all about prints that you can add to your closet for less than $50. Did you notice those prices above? I mean floral jeans for only $5.99! That is a steal! 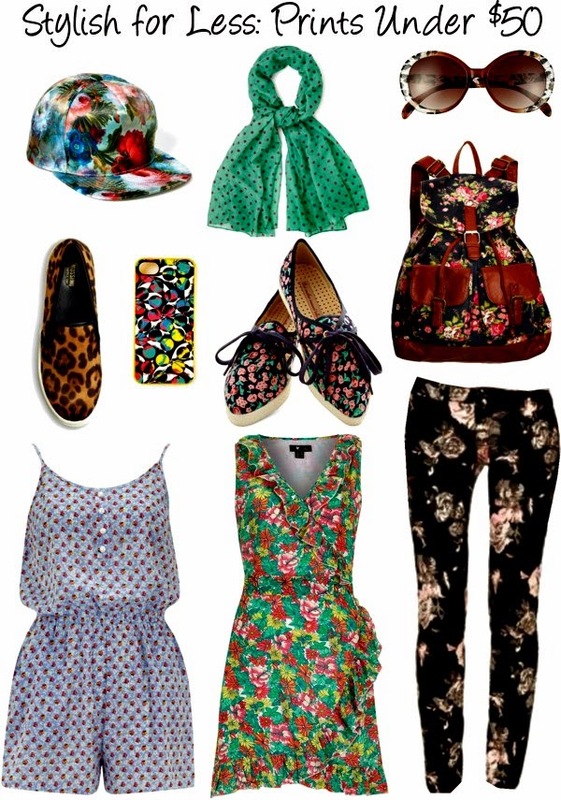 I believe everyone should have a variety of prints in their closet that they can count on as go to pieces. What are your thoughts? That jumpsuit is perfect, I need it in my life! i love those leopard shoes!! I need new leopard print slide on shoes. My new puppy went to town on mine! These are awesome! Love the jungle print dress! These prints are all fabulous and the under $50 price tag make them even better. Love the leopard print slip ons.